VoIP (or Voice over Internet Protocol) is a general term used to describe various transmission technologies, communication protocols, and methodologies that are used to provide voice communication over an internet connection rather than a POTS (Plain Old Telephone Service) copper line. 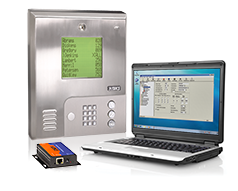 DKS 1830 Series PC Programmable Telephone Entry and Access Control Systems (1833, 1834, 1835, 1837) can be fitted with a TCP/IP adapter to provide the internet connection for data transfer from the entry sytem to/from the programming PC. The VoIP connection will require a VoIP service provider subscription and hardware. The 1830-185 TCP/IP adapter requires manual setup, but there are no subscription fees, other than those charged by the VoIP provider. The 1830-186 TCP/IP adapter is a simple plug and play device that setups all the required connections (IP address, Port Forwarding, etc.) automatically. An IM Server Client subscription and VoIP subscription is required for this. • A network connection from the TCP/IP adapter to a router is necessary to use this connection method and will provide both voice and data transmissions. There are limitaions in how far the network cable can be run.